The Banker says Becky threw aside the lifeline of £26,000. "Mummy are we going to Florida". The mind games continue. She said she told the Banker she was going all the way. She's ready for the question. To £13,000, IT'S A DEAL! I'd have to decline this and swap. The Banker would've offered more at 5 box and/or made an extra offer at 4 box if he saw the £50k. I’d have taken the £26K. Too dangerous of a board to justify going for the big money. The final ever time I will be saying that? Becky would've said NO SWAP. The mean is around £25,000. 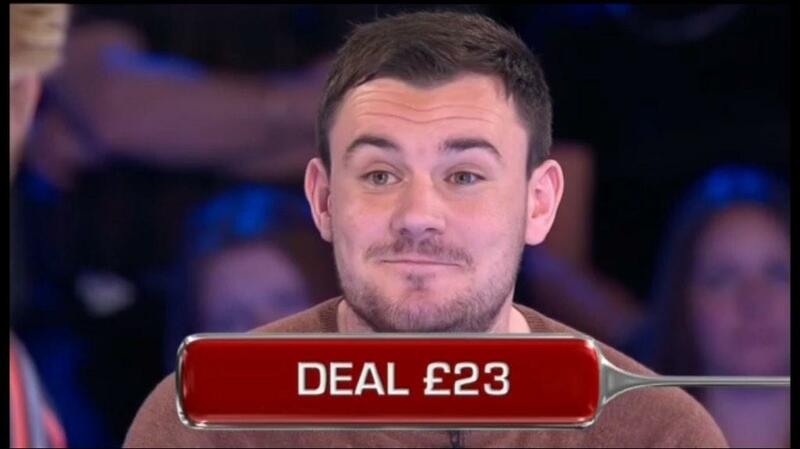 Why would he offer the Gamble at £26,000 on 1p and £50,000. It doesn't make sense. And that's exactly my point. Why offer a risk that's 1K over the mean? If I was Becky, I'd be furious that I was forced to be in a position where the Banker looked inside the box, especially with him confirming that he'd offer £40,000 on today's 5 box in normal play. I'll repeat what I said in Ashley's game: the Banker should NOT be allowed to look inside the player's box unless they agree to it. Becky probably dealt £40,000 at 5 box had the Banker not looked in the box. Unlucky that she couldn't find the 1p in the final round for the big money 2 box finish! Amazing how she wiped out most of the reds from the start apart from most of the important ones and held on so long to that block just missing the £100k! Unlucky result from perfectly reasonable decisions. Hopefully she won't have too many regrets. Hopefully she won't have too many regrets. Saying deal on it's own / not swapping the box. Had she discovered the 1p before two box then with a 100% GUARANTEED £50,000 would she have gone for it? It was an unlucky for Becky at Wookey Hole.